A pixel is a contraction if the term PIcture ELement. Digital images are made up of small squares, just like a tile mosaic on your kitchen or bathroom wall. Though a digital photograph looks smooth and continuous just like a regular photograph, it's actually composed of millions of tiny squares as shown below. Each pixel in the image has a numerical value of between 0 and 255 and is made up of three color channels. So for example a pixel could be 37-red, 76-green and 125-blue and it would then look like this . If it was 162-red, 27-green and 12-blue, it would look like this . There are over 16 million possible combinations using this scheme and each one represents a different color. Computer savvy readers will note that each color in this scheme can be represented by an 8-bit number (byte), so the color of each pixel is defined by three color bytes. This scheme can be expanded, for example to use 16-bits (two 8-bit bytes) for each color. Images using three 8-bit values are sometimes called 24-bit color images. Images using three 12-bit values for color definition are called 36-bit color images, and those using three 16-bit values are called 48-bit color images. One of the main ways that manufacturers categorize their digital cameras is in terms of pixel count. What this is is the number of individual pixels that go into making each image. Today this number varies between 1 million (1 Megapixel) to around 14 million (14 Megapixels). A million pixels is abbreviated to MP, so a 1MP camera has 1 million pixels and a 3MP camera has 3 million pixels. Currently most popular consumer digital cameras have between 2MP and 5MP. A 3MP camera can make excellent 4"x6" prints and very good 5"x7" prints. If you intend to make lots of 8"x10" prints, then perhaps a 4MP or 5MP camera would be a better choice. Sometimes two numbers are given, total pixels and effective pixels. 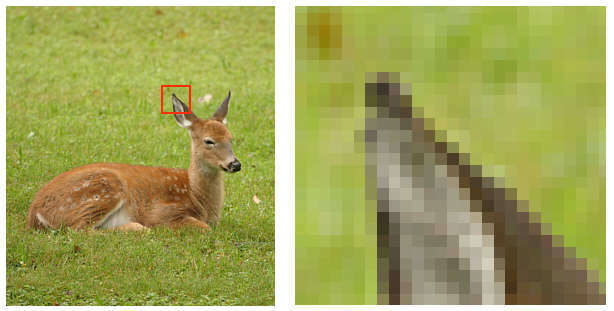 Total pixels count every pixel on the sensor surface. Usually the very edge pixels aren't used in the final image. Effective pixels are the number of pixels actually used in the image after the edge pixels have been dropped. Print size at 320dpi 6.5" x 4.8" 7.1" x 5.4" 8.1" x 6.1"
Print size at 240dpi 8.5" x 6.4" 9.5" x 7.1" 10.8" x 8.1"
The aspect ratio of a camera is the ratio of the length of the sides of the images. For example, a traditional 35mm film frame is approximately 36mm wide and 24mm HIGH. This has an aspect ratio of 36:24, which can equally well be expressed as 3:2. Some digicams use the same aspect ratio for their digital images. For example most digital SLR (single lens reflex) cameras have a 3:2 aspect ratio. However, video monitors typically use a 4:3 aspect ratio. For example a monitor with a 800x600 display has a 4:3 aspect ratio. With this in mind, most consumer level digicams use a 4:3 aspect ratio for their images. The size of the digital sensor element (which is equivalent to the size of the negative for film cameras) is pretty small in all consumer digicams - typically around the size of a fingernail (and a small fingernail at that!). As I said above, a 35mm film frame is 24mm high by 36mm wide but most digital cameras use sensors very much smaller than this. Here are some typical digicam sensor sizes. The "name" of the sensor is based on specification for old TV tubes used in the 1950s. Nobody is quite sure why it's being used for modern digital sensors since the "sizes" don't really relate in any consistent way to the actual physical size of the sensor. However these names are widely used, so it's best to know what they are. They are often listed in digital camera spec sheets. Another factor in quality here is that small sensors tend to be of a different type than large sensors. Small sensors, and the sensors used on all consumer digital cameras, use a scheme which can read the data from the sensor in real time using a scheme called "interline transfer" and the CCD electronics control exposure rather than a mechanical shutter. Large sensors used on more expensive Digital SLRs are often of a different design known as full frame - which doesn't refer to their size, but their design - and which require the use of a mechanical shutter. They don't read out and the display the data in real time, only after the exposure so they can't give real time LCD displays or record video. The advantage of this scheme is that the whole pixel area can be used to capture light while interline transfer CCDs use part of each pixels to store charge. Since smaller pixel areas generate more noise and interline transfer CCDs are not only smaller to start with but use some of their pixel area for charge storage, their noise level is significantly higher. So the smaller interline transfer sensors in consumer digital cameras yield lower quality images than those used in higher end DSLRs, they can do more "tricks" like recording video clips and giving a live image display on their LCD screen. The lack of a mechanical shutter also makes the cameras cheaper and simplifies construction. With film you can buy "daylight balanced film" for shooting outdoors or "tungsten balanced film" for shooting indoors under normal domestic lighting (not fluorescents!). If you use daylight film under tungsten light the images will be very yellow. If you use tungsten film in daylight the images will be very blue. With film you have to correct for the "color temperature" of the light using filters or by the right choice of film. With digital you can pick your white balance to suit your light source, so that white looks white, not yellow or blue. Normally there is an automatic setting and the camera decides what white balance setting to use. However if you know what your light source is you can usually set the camera to it and this may give better results. Most digital cameras have settings for sunlight, shade, electronic flash, fluorescent lighting and tungsten lighting. Some have a manual or custom setting where you point the camera at a white card and let the camera figure out what setting to use to make it white. Sensitivity settings on digital cameras are the equivalent of ISO ratings on film. Just about every digital camera will have settings with a sensitivity equivalent to ISO 100 film and ISO 200 film. Many will have an ISO 400 setting, but above that the images from cameras with small sensors gets pretty noisy. The more expensive digital SLRs with much larger sensors have much higher sensitivity settings. At ISO 400 they are virtually noise free and some can go as high as ISO 3200 or even ISO 6400! Very few cameras have ISO setting lower than ISO 100 because noise levels are so low at ISO 100 there would be no real advantage in a slower setting. Quite a few digital cameras have an "auto" ISO setting, where the camera will pick from ISO 100, ISO 200 and sometimes ISO 400, depending on the light level and the mode in which the camera is operating. The size of the digital file corresponding to the image which the camera produces depends on the pixel count. 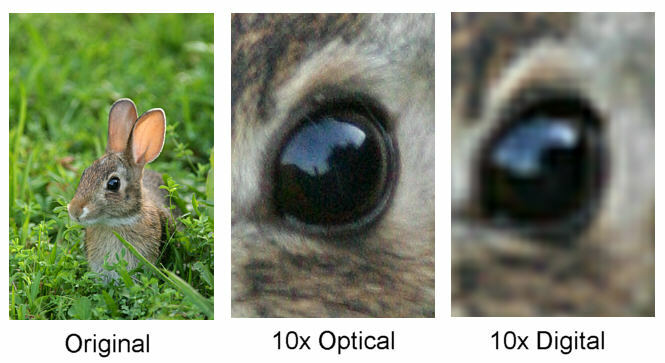 In most consumer digicams each pixel generates 3 bytes of data (so called "8-bit data"). One for red, one for green and one for blue. This means that a 3MP camera, which has 3 million pixels, generates 9 million bytes of data, or 9MB (megabytes). A few cameras can generate extra data for extra quality, and some of these cameras generate files which correspond to 2 bytes of data for each color ("16-bit"), so a 3MP camera which is capable of generating 16-bit data will produce an 18MB image file. Now these files are pretty big and they can be compressed quite a lot without a significant drop in quality. This is where JPEG (Joint Photo Experts Group) comes in. JPEG is an algorithm designed to work with continuous tone photographic images) which takes image data and compresses it in a lossy manner (this means you do lose some information). The more you compress, the smaller the file but the more information you lose. However, you can reduce file size by a factor of 10 or so and still get a very high quality image, just about as good as the uncompressed image for most purposes. You can reduce the file size by a factor of 40 - or even more - but the image starts to look really bad! On the left, 10:1 JPEG compression. On the Right 40:1 compression. Uncompressed the image would look virtually identical to the 10:1 JPEG on the left. With 10:1 compression the 8-bit files generated by a 3MP camera would be 900Kbytes in size rather than 9Mbytes, which is a big saving with little quality loss. The smaller files take up much less storage space and are much faster to send between computers or from the digital camera or memory card to a computer. There are also lossless ways of saving files using TIFF (Tagged Image File Format) . These keep all the original information, but at the cost of much bigger files. TIFF files can be compressed in a non-lossy way, but they don't get very much smaller. 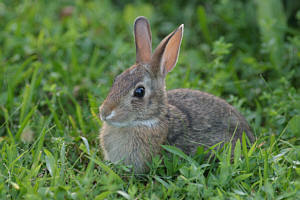 For example, compare the file sizes for the rabbit image above: TIFF files can also be used to save 16-bit data (those these files are twice the size of 8-bit data files), JPEG files can only save 8-bit data. Some cameras offer a third option, that of saving the actual data generated by the sensor in a proprietary format. Canon calls their version of this "RAW", Nikon call it "NEF". These files are compressed, but in a non-lossy manner. They are significantly smaller than equivalent TIFF files, but larger than JPEGs. Typically they achieve a compression of around 6:1 using 16-bit data, so files are 1/6 the size of equivalent TIFF files. The only disadvantage of these formats is that the image must be converted to either JPEG or TIFF for most software to be able to display them. The conversion is quite a complex process and can be time consuming if you have a lot of images to convert and a PC that's not very fast. Since the RAW and NEF formats contain more information than JPEGs (and in fact often more than TIFF files) you can do some degree of exposure compensation during conversion to JPEG to rescue otherwise improperly exposed images. You can also make white balance corrections during conversion, so if you shot with the wrong white balance, you can fix your error. There's lots of confusion here so I'll try to go slowly! When you display a digital image on a monitor, the only thing that determines the size of the image is the pixel count and aspect ratio. DPI and PPI (and I'll explain them later) mean absolutely nothing. If your image is a 480Kbyte file which is 800 pixels wide by 600 pixels wide, it will display as a full screen image if you are using an 800x600 display. It doesn't matter if your DPI is set to 1 or 1000 or if your PPI is set to 1 or 1000. This is 100% true as far as web display goes and as far as any monitor display goes - unless some software intervenes. For example the IE6 browser will take large images and resize them so they fit on the screen. However DPI and PPI are still ignored. A few advanced page layout programs and advanced image editors may be capable of taking DPI and PPI into account when displaying images. So I'll say this once again. The way you control how large an image appears on someone's monitor screen when viewing your images on the web is by changing the pixel count. If your original image is 1600x1200 pixels it will probably be too large to see all at once on 95% of the video monitors out there. It will also be slow to load since it will be a large file. If you want someone using an 800x600 display to be able to see your image clearly, you need to change the size to, say, 600x400 pixels (remember the browser window is smaller than the full monitor display). You change image size in software. All image editing programs can do this. Sometimes it's called "downsampling" or "downsizing". See your image processing software manual for details on what options your software offers. PPI stands for "Pixels per inch" and is almost exclusively used for printing, not video display. If you take an image that is 800 pixels wide and 600 pixels high, and you print it with a PPI setting of 100 pixels per inch, the print will be 8 inches wide by 6 inches high. If you print at 200 PPI you get a print 4" wide by 3" high. Now the print at 200 PPI will be higher in quality but smaller. Most people seem to agree that around 320 PPI is the highest number you really need. Above that it's very hard to see any improvement in image quality. 240 PPI is often used and even that is often regarded as high quality. Most people notice a quality drop when they go below 180 PPI. DPI stands for "dots per inch" and is a property of a printer, not a digital image. It's a measure of how finely spaced the droplets of ink can be in a print. However the number is a bit misleading since it's not always measured in the way you think it might be! Printer settings of 360dpi, 720dpi, 1440dpi and 2880dpi are often found. However the difference between then is subtle at best. Most people probably couldn't tell the difference and 360dpi usually looks great. Changing DPI does not change the size of the print. PPI controls that. DPI controls print quality (though as I said, over 360dpi you don't see much change). There are quite a few different (and incompatible) memory cards used in digital cameras. Compact Flash (CF) - The original memory card. 42mm x 36mm x 3mm. Somewhat larger than the others, but used on all high end DSLRs. Available in capacities up to 2GB. There are also miniature hard drives (Microdrives) with almost the same form factor as CF cards (CF type II, 5mm thick)) which are available in capacities from 340MB to 4GB. Microdrives used to be cheaper than solid state CF cards, though there is not a big difference today up to about 1GB. The 4GB Microdrives are actually cheaper than the 2GB CF cards though. Of course prices change pretty fast these days! Overall CF cards tend to be cheaper than any of the other forms of solid state memory - though this too could change. CF cards and microdrives contain their own disk controller, so that makes the camera electronics simpler. Secure Digital (SD) - Very small - about 24mm x 32mm and 2mm thick. They have a built in write protect switch to prevent accidental erasure and certain encryption capabilities of little interest to digital camera owners. Multimedia - Same size as SD but with less features and no encryption capability. There are some that can be used in some SD cameras but they aren't 100% compatible with SD cards in all applications. Smart Media - Thinner than CF cards, but lacking an on-card memory controller. Despite the name, they're pretty dumb! Is there any real difference in performance? No, not really. The CF cards are the cheapest per megabyte and are available in higher capacity models than the other (of course that may change with time). Most high end DSLRs use them. The smaller cards tend to be used in the smaller consumer digicams. There's really no reason to pick a camera with one type over another unless you have multiple cameras or other devices (MP3 players for example) which also use memory cards - then it's convenient if they can share cards. It may also be difficult (and/or expensive) to find really high capacity cards (1GB and up) in formats other than CF, but that's probably not a concern for most digicam users. The following table gives the approximate number of shots you can expect to get using low JPEG compression using various pixel count cameras in conjunction with various sized memory cards at the lowest ISO speed settings of a typical camera. The exact numbers depend on how much compression the camera applies and the ISO speed used. Higher ISO settings result in more noise and noise is hard to compress and so leads to larger files and less images per card. If you're shooting in a RAW or NEF format you can divide these numbers by 3. If you're shooting TIFF files you'd have to divide these numbers by 8. Once you've got the images stored in your camera on the memory card you need a way to get them into your computer! There are several ways to connect digital cameras to a PC as well as external card readers. USB 2.0 - A development of USB but much faster - up to 480 megabits/second. USB devices are compatible with USB1.1 ports on a PC, but will only work with them at the lower data rate. IEEE 1394 (Firewire) - Though this is an older interface than USB, it was originally only really used much on Apple computers. It's capable of high speed transfer (400 megabits/second) and it's now found on some PCs or it can be added to them via a plug-in card. More common on digital video cameras than still digital cameras. Just about all cameras can connect to a PC, but it's sometimes easier to remove the memory card from the camera and insert it into a dedicated card reader. Even if your camera only has USB 1.1. if your computer has a USB 2.0 you can use a USB 2.0 card reader for faster transfer. Card readers are cheap, anywhere from $15 to $40. Sad to say there are more dishonest discount camera stores than you'll find in almost any other business. Some of the popular photography magazines are cram full of ads advertising very low prices. What they don't tell you is that you won't ever actually get the camera for that price. Either they will add on $75 in shipping charges or they will be "out of stock" on that model, but they will have a more expensive model available of course. Sometimes they'll tell you that the advertised camera is plastic in made in Taiwan, but for another $50 you can get the model made in Japan. Sometimes they'll ship you the wrong item in the hope that it will be too much trouble to send it back. Shop in the ads at the back of magazines based only on the lowest price you see and most of the time you'll be sorry. However, there are reputable discount dealers and is associated with a few of them. These dealers do give pa small commission on sales made through their website via the links below, so please use them if they have what you want at a good price. They're honest, they stock what they advertise, they have low shipping charges, good prices and responsive customer service. If they didn't we wouldn't be associated with them and we wouldn't recommend shopping with them.